Scott Nickerson is making a name for himself in the world of classic realist portraiture. His style, the layering of texture and color, emulates that of 17th century realists with the color sense of the impressionist artists. For Scott, being an artist is a way of life; it's not something he turns on and off. "It's not a nine-to-five job for me; twenty four hours a day I am an artist." Scott's impressive portraiture both introduces and acquaints you with its subject, and leaves you feeling like you have had a glimpse into their soul. Now a Tinton Falls resident, Scott grew up in Jersey City where he attended Hudson Catholic High School. The art department got him started working in oils, rather than the usual beginning with acrylics. A few years later, he attended the School of Visual Arts in New York, studying under notable Steven Assael. "When I made it to art school, everything started to click", says Nickerson. "I could finally see the exact direction I wanted to go in with portraiture." Under Assael's tutelage, Nickerson learned about color temperatures, and a multi-stage process of layering paint and glaze, which creates a translucent quality with more warmth and natural skin tones. Since graduating with honors from the School of Visual Arts, Scott has continued his education at the Art Students League in New York and at Studio Incamminati in Philadelphia under the direction of world renowned artist Nelson Shanks. When not attending class or working on commissions, Nickerson teaches day and evening classes at Colorest Studios (732-741-0001) in Red Bank, NJ. 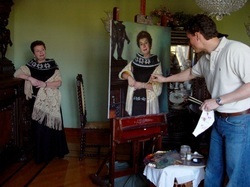 Nickerson has been teaching oil painting and drawing from the figure for 12 years. Scott is also involved in numerous art organizations, including the Portrait Society of America, and the American Society of Portrait Artists.